Markets are supposed to price in new information efficiently. But for the investor who has done their homework in advance, time is on their side. Stock prices can react gradually rather than instantly to new information. Information can sit in the public domain but not be widely known and understood. While information may exist in the public domain, it may not have been distributed widely; or it may be widely distributed without a broad base of investors having the additional knowledge to understand the materiality of one piece of information among many. The smaller a company is, the less likely it is able to broadly disseminate new information; and the less likely that a broad base of investors understand the context of that information. 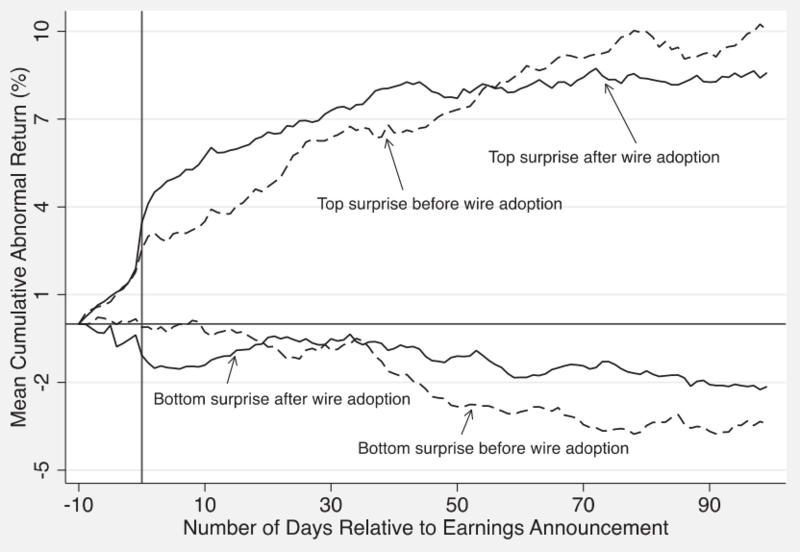 A European study measuring excess returns generated by stocks after surprise earnings results compared the outcome before and after companies adopted wire services (or news agencies) to broadcast news widely. The study found that even though new information was more rapidly priced in after the adoption of wire services, with stronger initial reactions and lower post-earnings price “drift”, it still takes time for markets to fully react to material new information. This is illustrated in the chart below. So for the investor who happens to have done the right homework and immediately understands the implications of new information, time is on their side. Even at the macro level, there is evidence prices do not rapidly adjust to new information. A 2017 study by Columbia University academics Calomiris & Mamaysky examined news flow and pricing in 51 stock awards markets and concluded that “Economic and statistical significance are high and larger for year-ahead than monthly predictions” - ie rather than immediately re-pricing, markets take time to adjust to new information. Great read Martin. I think it's particularly interesting that the share prices appear to begin moving in the correct direction a few days before the announcement. I agree with Patrick, insider trading appears to be alive and well as difficult it may be to prove.